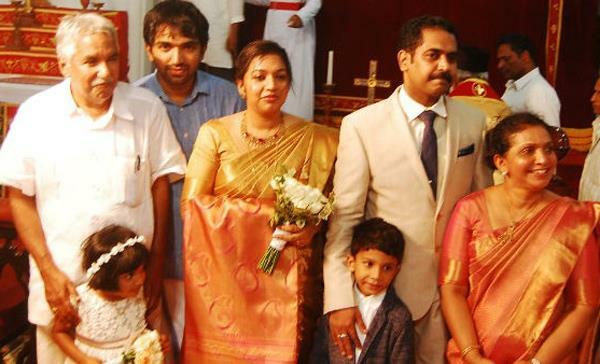 Kerala chief minister Oommen Chandy's daughter Maria Oommen got married to Varghese George, a businessman. The marriage was held at Palayam Orthodox Church which was attended by only close relatives and friends. A reception was also given to the invites at the cliff house. Kerala chief minister Sri.Oommen Chandy's elder daughter Maria Oommen got married to Varghese George, a businessman who works outside Kerala. Varghese George's family 'Manayathu' is located in Ernakulam. The marriage was held at Palayam Orthodox Church which was attended by only close relatives and friends. A reception was also given to the invites at the cliff house. As like his political career, Oommen Chandy does give prime importance to his family life too. Being a caring father to his daughters and son, he is loved and respected by all in the family. Even during his busy schedule with political matters, he finds time to spend with his family. Sri Oommen Chandy's family includes his wife Smt. Mariamma Oommen, a son Chandy Oommen and Daughters Maria and Achu. Meanwhile Sri Oommen Chandy who was supposed to attend the swearing-in ceremony of Narendra Modi as Prime Minister will not be a part of it due to some engagements in Kerala. But various other political leaders representing their party from the state would attend the function which is being held at New Delhi. Tight security has been arranged in view of the swearing-in ceremony which will be attended by foreign leaders. More than 10,000 personnel are being deployed to secure the Rashtrapati Bhavan while security arrangements have been made in the hotels where top dignitaries are staying. Oomen Chandy is the current leader of UDF and the opposiiton leader in the Kerala state assembly. He is known as the leader of common people and is always available to solve their problems. Oommen Chandy was the 19th chief minister of Kerala and a man of Exemplary conduct. His simple and dedicated life style have earned respect in the minds of all the Keralites. Here is the list of ministers of kerala with address, email ID and department. The ministers of 2006-2011 details are given here. Oommen Chandy is the 2011 chief minister and the UDF leader in Kerala. Read more about his family, education and political life.